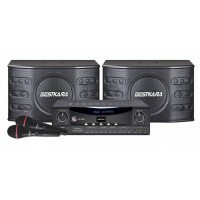 Beskara 5000 with LA-5000 300 watts (150 watts x 2 , 8ohms) power output, built-in 13 steps key control for entry level karaoke enthusiasm. with SA-5000, 3 ways 3 speaker, 450 watts output Bass Reflex speaker system, 10" subwoofer and 2 x8 cm Tweeter could produce an extra-ordinary sound output that will made you sing all day long. 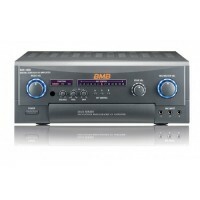 ..
BIK BA-77 KARAOKE POWER AMPLIFIER Max Rated Output Power: 350W + 350W (8ohms) Music Frequency Response: 20Hz – 25KHz Mic Frequency Response: 20Hz – 30KHz Total Harmonic Distortion: 0.08% Music Tone Control: Treble: +10dB (10KHz) Bass: +10dB (100Hz) Mic Tone Control: Bass: +5dB (100Hz) Mid: +5dB (2KHz) Treble: +5dB (10KHz) Key Control: 11 Steps +/- 2 pitch F.B. EX. 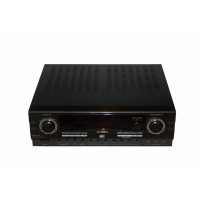 (mic howling): 3 modes (small, mid, large room) Music..
DAX-1000 (SE) II1000 BMB DIGITAL ECHO AMPLIFIER > High Power 4 Channel AV Amplifier > Digital Stereo Echo > Anti-Feedback Feature > Remote Control > Maximum Output Power : 200W x 4 CH > Key Control: 13-StepStepStepStep > Microphone Input : 5 Systems (Front 3, Rear 2) > Dimensions (mm) : 420(W) x 159(H) 415(D) BMB DAX-1000 Digital Karaoke Amplifier ..
BMB DAX-1000 Digital echo Karaoke system ideal for home entertainment, Club House, Karaoke room. 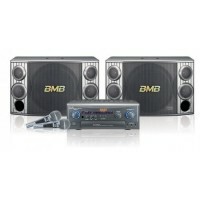 System consist of BMB DAX-1000 II with 800 watts music output power (200 watts x 4), with BMB CSX-1000, 12" Bass reflex Subwoofer produce fine low frequency, 2 x 8cm tweeter and 2 x8 cm squewker take care of the high frenquency, CSX-1000 could handle up to 700 watts input power. ..